The lung anatomy and physiology is well adapted to handle exogenous aerosols and rapidly process them for clearance. Only in a few circumstances in nature are these defenses breached, with dire consequences, as in the case of asbestos. For controlled drug delivery to the lung, however, the goal is to slow or evade these clearance mechanisms using biocompatible systems that elicit no inflammatory response but allow modulated drug release. In this chapter, we introduce briefly the principles of the lung clearance mechanisms including mucociliary, absorptive, phagocytic, and metabolic clearance. 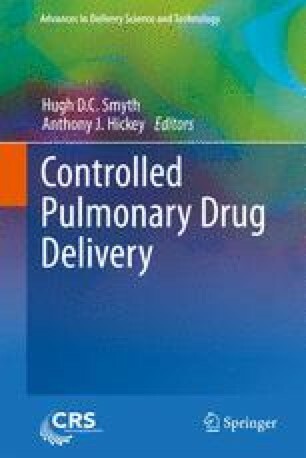 Then, we review the literature and present the current and emerging approaches to effectively control release in the pulmonary system. These approaches include manipulating drug deposition site, modifying drug absorption rates, eluding macrophage uptake, and controlling degradation of the therapeutic agent.